It has been hot, hot and hot here in the Interior of Alaska, with temps in the 90s. I reach my heat tolerance limit at about 70 so the heat and humidity has been pretty miserable. It reminds me of the sweaty summers of my childhood. Prior to the heat it was in the 60s and raining – hard – which creates boot sucking mud in the dog yard. Oh Mother Nature, could we please just have sunny days with temps about 70 degrees? A day of rain here or there to keep the summer fires away. Perfect. 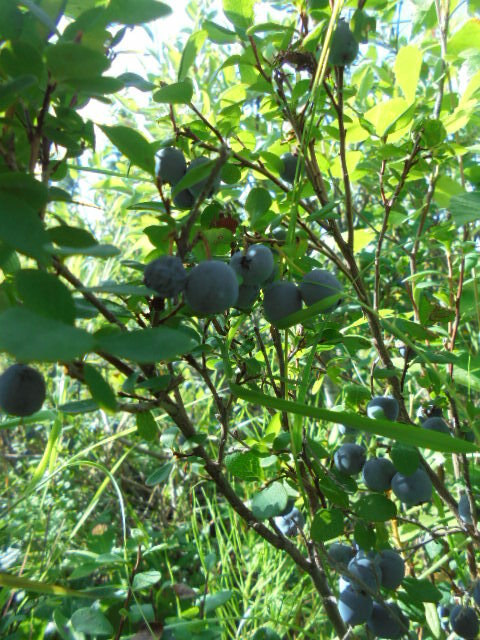 This afternoon was partly cloudy and the blueberries were calling me. They are ready early this year and I have my sights set on homemade blueberry jam and freezing some of those berries for a taste of summer when it’s 40 below. 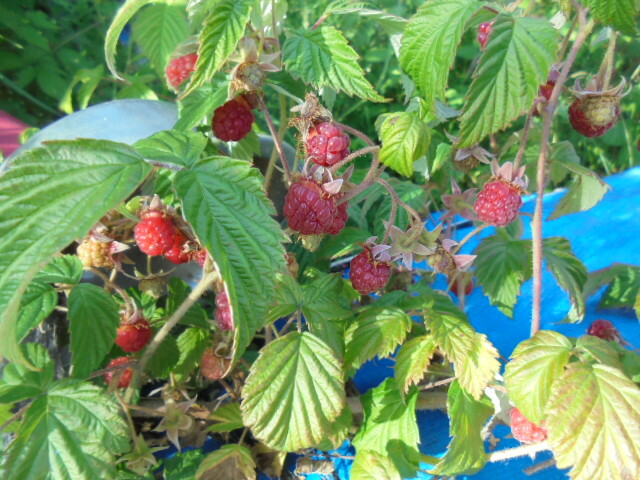 The raspberries have also ripened at the same time. Oh the bounty!! Blueberries just waiting for me to pick them. Raspberries right at the back of the house. 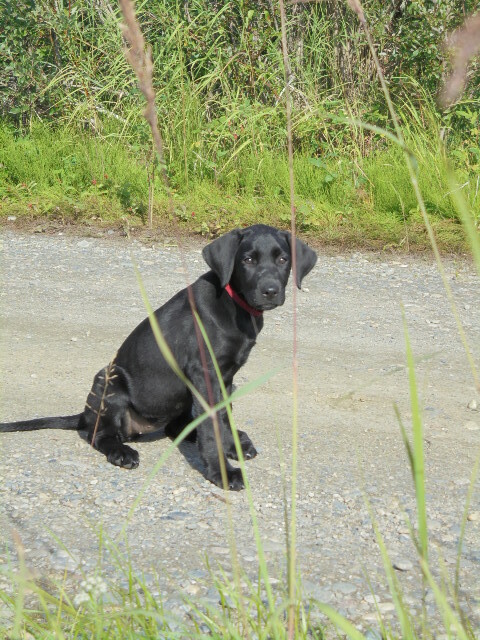 Bella, Sasha and I set out down the lane way next door to pick blueberries. It was a perfect afternoon – warm, breezy and few mosquitoes. 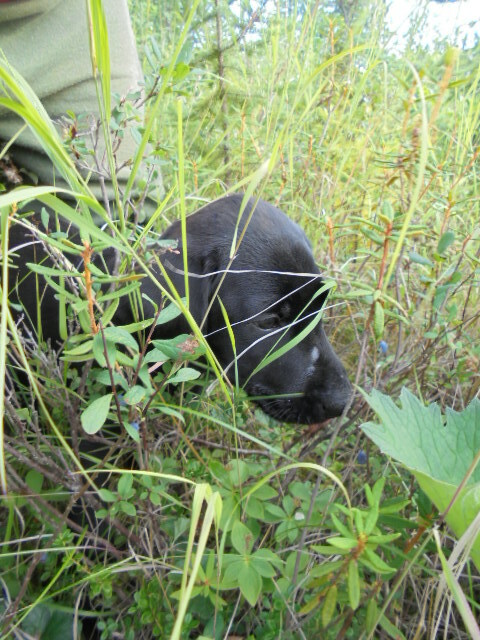 Sasha and Bella romped around in the swamp just behind the blueberry bushes. The swamp I diligently tried to avoid. The swamp I fell into. Picking berries is good for the belly and for the soul. You become aware of the sweet smell of the plant, the buzzing of various insects, the aroma of the damp earth in the wetlands and suddenly you aren’t thinking about much else. Sasha, aka Pumpkin, decided on an impromptu run after our friend John when he drove by with his truck, heading to his dog yard. She has selective hearing where following John is concerned. I wasn’t worried – I knew he would tie her up while he was down at his place and then bring her back my way. Bella ignored the temptation to follow and was instead content with picking her own berries. Bella learned very quickly how to pick her own blueberries. We are still getting used to each other and she is so sweet and a constant shadow, but sometimes I get the feeling she wonders what weird thing we could possibly do next. This is the look that makes me think that. In addition to the wild bounty, the garden is thriving. I know I have said it before, but I am always amazed that, against all genetic odds, I somehow manage to grow things. Like corn! 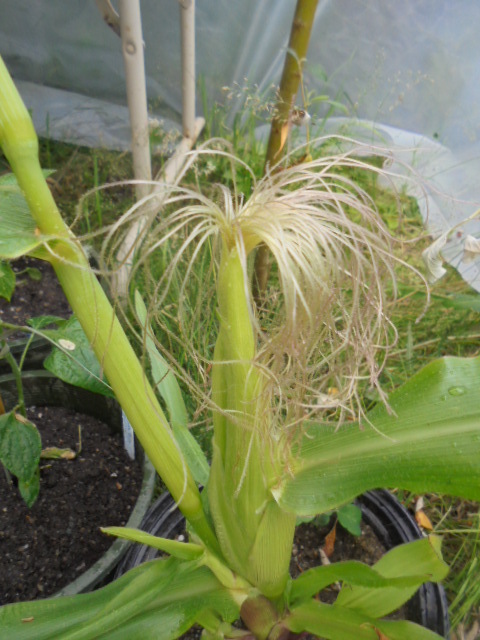 I may only get 2 cobs but I am growing corn! This one is my favorite. It has character and needs a name. My potatoes have taken off. This is an earlier shot. The pots have already been completely filled with dirt and now cages have been made with a straw lining and more dirt added. We may have plenty of spuds this harvest! 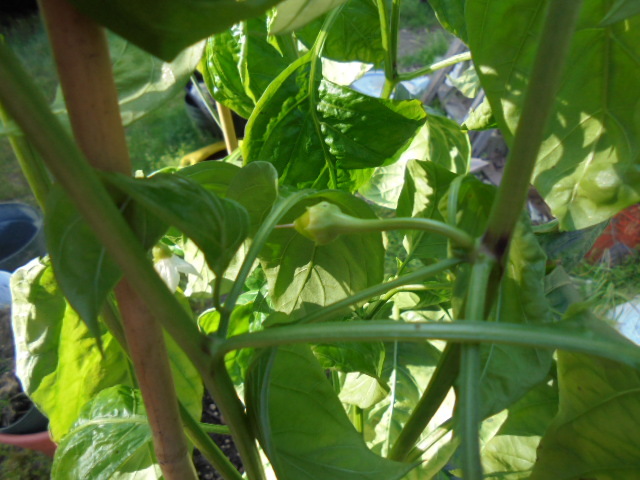 My experiment in growing a variety of hot peppers seems to be succeeding as well. The late peppers are starting to grow. How is this even possible? The beginning of a Beaver Dam pepper. Soon there will be a flurry of canning and drying and all sorts of goodness. The land gives us just about everything we need. So grateful! 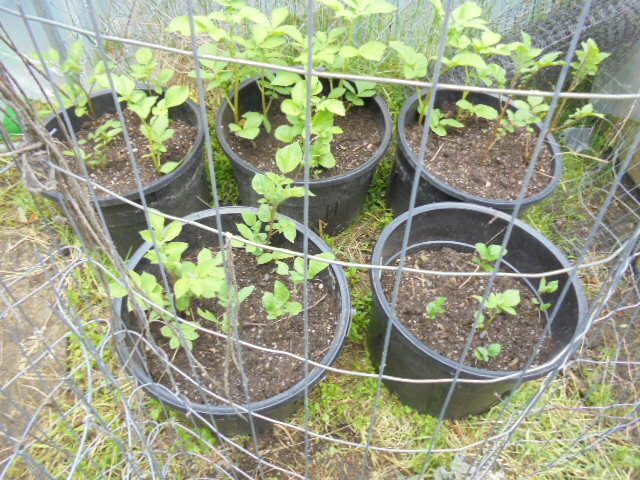 This entry was posted in Uncategorized and tagged Alaska gardening, blueberries, canning, raspberries. Bookmark the permalink.